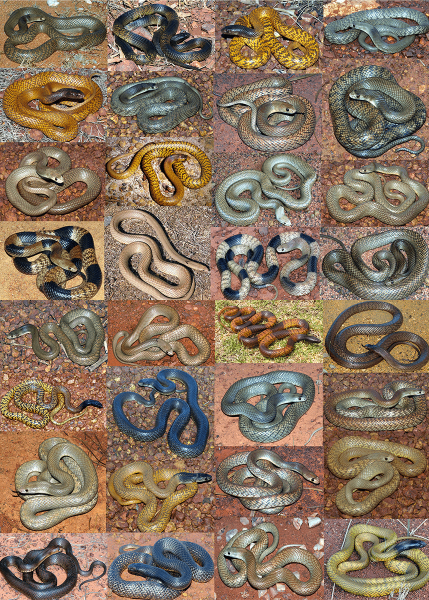 The western brown snake (Pseudonaja mengdeni) is highly variable in colour and pattern, as demonstrated in this collage of images by Brian Bush. Within certain species of snake, venom also varies in composition and activity among regional variants, as well as age groups. Detailed analysis of the preclinical efficacy of antivenoms using a combination of assays recommended by the World Health Organization (WHO), including antivenomic testing for specific toxin immunorecognition by antivenoms. Formulation and characterisation of Working Reference Standards (WRS) and National Venom Reference Standards (NVRS) and their submission for independent validation by National Drug Control Laboratories (DCL). The catalyst for this work has in part been the call by the WHO for all countries to work towards producing Venom Reference Standards as a key contribution to the process for strengthening the production and regulation of snake antivenoms. A reference venom is an essential prerequisite for the uniform testing of either successive batch lots of any one particular antivenom, or batch lots of antivenoms from more than one manufacturer. Reference venoms enable regulatory agencies, antivenom manufacturers and others to evaluate both the venoms used in production of antivenom immunoglobulin products and the products themselves, and are fundamental to establishing appropriate systems for testing of both existing and new products. Reference venoms are also essential to the establishment of prequalification systems for antivenoms. The WHO is interested in introducing a prequalification system for snake antivenoms, yet the absence of a source of Venom Reference Standards is a barrier to implementing this approach.